The younger son of Burma's pro-democracy leader Aung San Suu Kyi has been granted a visa to visit his mother after her release from house arrest. 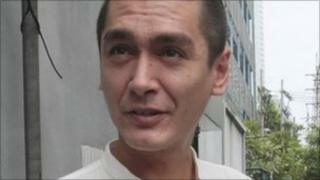 Kim Aris, 33, who lives in the UK, travelled to Thailand before his mother was freed on 13 November. The 65-year-old opposition leader has been kept in detention for much of the past 21 years by the ruling generals. She has not seen Kim or her elder son Alexander for about 10 years, and has grandchildren she has never met. A lawyer for Aung San Suu Kyi told the BBC Burmese service that Kim Aris had been given a visa to visit Burma. Nyan Win said Mr Aris was expected to arrive in Rangoon on Tuesday morning. Mr Aris told the BBC his mother was planning to meet him at the airport and that he was very excited. Aung San Suu Kyi last saw Mr Aris in December 2000; since then he has been repeatedly denied permission to enter the country. Aung San Suu Kyi was released from house arrest less than a week after the country's first election for 20 years - which was widely condemned as a sham designed to consolidate the military rulers' power. Mr Aris had an "emotional" telephone conversation with his mother on the evening of her release, the British embassy in Bangkok said. Aung San Suu Kyi's husband, a British academic, died in 1999. In the final stages of his battle with cancer, the military rulers refused him a visa to see his wife. Many believe that if she were to leave Burma, the pro-democracy campaigner would never be allowed to return.